“ The powers of Evil can take many forms. Remember that, Sir Henry, when you're at Baskerville Hall. Do as the legend tells and avoid the moor when the forces of darkness are exalted." To borrow Sherlock Holmes’s own famous phrase, Hammer’s The Hound of the Baskervilles is rather elementary. That’s usually a term that’s reserved as a slight, but, in typical Hammer fashion, the smooth ease of this Holmes adaptation is a boon. One of the more horror-tinged Holmes tale (as well as one of the most popular), The Hound of the Baskervilles seemed destined for an update at the Hammer House of Horror. Centering around a curse placed on the aristocratic Baskerville family after Sir Hugo killed a girl several generations go, the film finds Sherlock Holmes (Peter Cushing) investigating the estate after it’s inherited by Sir Henry (Christopher Lee). Supposedly, a hound of hell continues to stalk the ground and haunts every Baskerville heir by inducing a heart attack. With trusty sidekick Watson (Andre Morell) in tow, Holmes begins to unravel this outrageous legend. While this take on The Hound of Baskervilles exhibits some alterations from the original story, it manages to pop and crackle with Hammer’s signature leanness. Bolstered by strong, lived-in performances and its handsomely mounted production, Terence Fisher’s film is a rock solid entry in the early Hammer canon. As a mystery, it’s mostly well-wrought and exhibits the Hammer leanness that Jimmy Sangster especially popularized, as the screenplay moves at a breezy clip and manages to effortlessly parcel out characters and red herrings to draw out its intrigue. The central concept--a killer ghost hound--is silly and lends itself to an enjoyable and jaunty adaptation such as this. There’s a real sense of affection that’s evident in The Hound of the Baskervilles; it’s well known that Cushing himself was a big fan of the material, and you can sense this in his portrayal of the great detective. Cushing’s professionalism and a refusal to sleepwalk through any role resulted in an incredible body of work, but his Holmes is among his most agreeable turns. His Holmes is confident but not cocky despite being about three steps ahead of anyone; one senses that Cushing especially couldn’t resist the theatricality of the character’s bigger moments, and it seems like he was born to pose in triumph and puff on that signature pipe. Watching him lord over those who presume to be manipulating him is especially a delight; Holmes’s intelligence and assuredness are never in question. That Cushing treads on the boundary of smarminess but never crosses it is a testament to his range; just a year earlier, his similarly egotistical Baron Frankenstein came off as a real cad, and Cushing softens Holmes with a little bit of that Van Helsing empathy. Holmes’s disappearance is the film’s biggest sin; there’s a long stretch where he’s off investigating a lead relating to an escaped convict who slipped the noose via an insanity plea. In the meantime, Watson ends up babysitting Sir Henry Baskerville for a stretch, which isn’t altogether bad since Morell’s portrayal of Watson is supremely grounded and dignified. Instead of providing buffoonish comic relief, he’s nearly treated as Holmes’s equal, and his teaming with Lee is an acceptable substitute for Holmes’s sleuthing. This was one of the earliest out-of-makeup turns that Lee had for Hammer, and it represents one of those times where he actually wasn’t facing off against Cushing (presumably--after all, everyone is a suspect). The rest of the cast is rounded out by performers who didn’t do many tours of duty with Hammer; the woman of the piece is Marla Landi’s Cecile, who looks to get her claws into Lee in one of the actor’s few on-screen romances (in fact, I’m hard-pressed to think of any others). At the helm is Terence Fisher, one of horror’s most underestimated auteurs. I think there’s a tendency to undervalue Fisher because his auterist stamp is so synonymous with Hammer’s house style; however, it can be argued that he (along with cinematographer Jack Asher) defined that style in the first place. 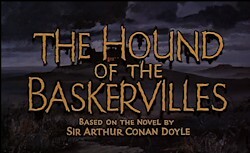 The rapidity with which they refined that style is astounding; The Hound of the Baskervilles is the fourth proper Hammer horror film, and one can already see the hallmarks on display in the lavish set designs and smooth photography. Arthur Conan Doyle’s original story is more of a suspense-mystery with a dash of horrific peppering, but make no mistake: Fisher’s film sprinkles even more of it on in the way of killer tarantulas, ritual sacrifices, and mine shaft excursions. A chilly gothic air overhangs everything and permeates every frame just as the dense fog crawls through the eerie moors and ominous forests surrounding the Baskerville estate. The Hound of the Baskervilles isn’t an upper echelon Hammer horror, but it does reveal how effortlessly the company could churn out perfectly admirable and enjoyable films. Cushing’s Holmes is such a definitive take on the detective that I’m shocked Hammer never bothered to revisit the character (Cushing did play him again several times in other productions); it feels like there should have been a Holmes series to compliment the Frankenstein and Dracula franchises. I believe Holmes even investigated vampires at one point, so one could imagine how delightful it may have been to see him actually cross over into the Dracula series. Alas, this is the only Hammer Holmes, and it’s been treated to exactly one DVD release that’s about a decade old now. As such, it feels a little dated; the 1.66 transfer is non-anamorphic but otherwise solid, and the mono soundtrack is adequate enough. 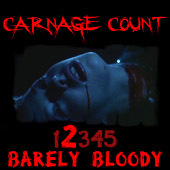 Like a lot of Hammer films, it’s really begging for an HD restoration to bring out the vibrancy of the production. For special features, there’s an original trailer and a featurette with Lee. Since Hammer is in the process of restoring their vaults, one hopes to see an updated release at some point since The Hound of the Baskervilles is a fine minor Hammer horror flick. Buy it!